This unit is a complete solar alternative kit. Complete with stand, this kit replaces the need for a 110v connection. The solar panel trickle charges the battery the same as the 110v connection. It is perfect for remote locations, long driveways, or energy conservative individuals. Solar energy is the cleanest, safest form of power available; using the sun for energy benefits the environment as well as your wallet and eliminates the concern of power outages. 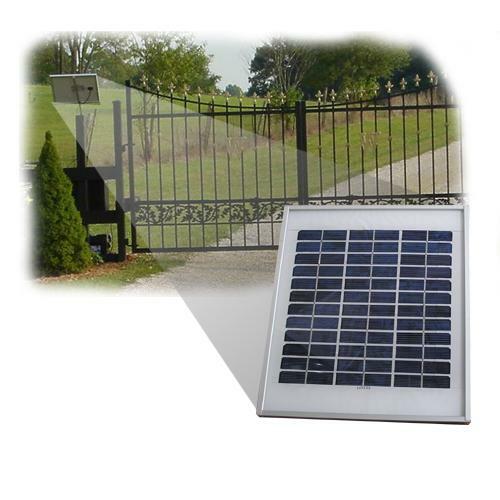 The solar panel is completely weatherproof, virtually indestructible, and works with most gate openers. DIYGateOpener.com’s non-glass solar panels feature a clear Tefzel® front covering and are mounted to an anodized aluminum frame. The heart of the solar panel is the Triple Junction silicon solar cell, which optimizes the amount of energy absorbed in low light situations. Each cell is composed of three semiconductor junctions stacked on top of each other for diverse light level absorption.